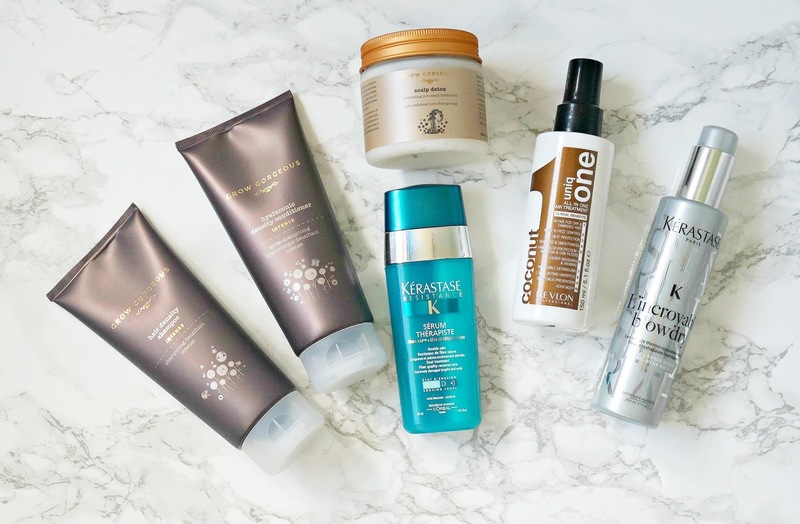 Current haircare loves featuring Grow Gorgeous, Kerastase & more! This year I haven't been posting monthly favourites, choosing instead to post about products that I am currently loving intermittently rather than regularly. Today I am sharing current haircare loves and I will soon post about my current skincare loves because there have been some very consistent products in my routines in recent times. This is because my scalp and skin have been suffering hugely over the past few months, but particularly over the last 6 weeks due to a mixture of a very bad reaction to a new moisturiser but also my skin and hair have really suffered due to the huge amounts of medications I have been on. These products have helped me to get my scalp and hair looking and feeling soothed, healthy and shiny. I'll post about them in order of how I use them. Grow Gorgeous Scalp Detox: We exfoliate the skin on our face and bodies so it makes sense that we should exfoliate our scalps too. My scalp has been very dry, tight and itchy for the past few months and I had tried a variety of shampoos and some scalp treatments but they left my hair feeling greasy so when the team from Grow Gorgeous got in touch to see if I wanted to try their latest release, which is a scalp exfoliator, I jumped at the chance! This is a pre-wash treatment that is applied to wet hair, massaged in and then left to work for a few minutes before rinsing. It contains Natural Caster Oil beads, White Willow Bark Extract and Pomegranate Fruit Enzymes all of which exfoliate the scalp and remove product build up. It initially felt a little bit strange to use but really that was because I was afraid that I wouldn't be able to rinse it easily, but I followed the instructions exactly and gave my scalp a really good scrub and it felt good because it's what I had been crying out for. The cooling sensation that follows is really soothing and it rinsed very easily. I now use this twice weekly and my scalp is not tight, itchy or flaking and is comfortable for the first time in months. I will definitely be repurchasing when I finish this pot because, quite simply, it works! £28. Grow Gorgeous Hair Density Shampoo Intense: I've used Grow Gorgeous Serum for a few months a number of times in the last few years and have always gotten great results (not good news for my roots and therefore bank balance, but good news overall) so I was excited to get the opportunity to try their Hair Density Shampoo because this claims to help improve the density, and therefore volume, of hair. It is formulated with Biotin (encourages faster hair growth), Caffeine (stimulates the roots of the hair) and Niacin (encourages cellular repair) and it is thicker in texture than a lot of other shampoos I have tried but it doesn't weigh the hair down and both lathers and rinses well. I massage this into my hair and then leave it to work for a minute before rinsing. £19. Grow Gorgeous Hyaluronic Density Conditioner Intense: I follow up with this conditioner, which is formulated with Niacin, 8 Amino Acids (to inject protein into the hair) and Hyaluronic Acid (makes the hair smoother and swells each strand of hair). This conditioner can be applied to the scalp to root and then left to work for a minute before rinsing. The combination of both the shampoo and conditioner makes my hair feel and look a lot thicker and healthier, which is especially noticeable when I tie my hair up as I can't wrap the bobbin around as many times as I usually would or if I use a grip, it doesn't hold my hair as tightly as it normally would. Neither product weighs my hair down and they also don't increase the need to wash my hair more often, thankfully. Both of these products are paraben and suphate free. I feel that my hair could still benefit from a mask used once weekly instead of the conditioner because my hair is quite damaged so that is the next product that I will try from the range! £18. Uniq One Coconut All In One Hair Treatment: A leave in conditioner/detangling treatment is an essential for me before combing my hair and I love this one because it has a number of benefits including repairing, helping to detangle, protecting against UV damage, preventing split ends and adding body to the hair. It also has a beautiful coconut scent (it comes in two other variations if coconut isn't your thing). This is a lightweight product that doesn't weigh the hair down or make it greasy quicker - instead my hair is easy to comb through and feels stronger with less breakage overall. Currently reduced to £9.50 from £13.99. Kérastase Resistance Therapiste Serum: I always add a little serum to my hair before drying to protect against heat damage and this one protects up to 230°C. I just mix one small pump of this to a small pump of Kerastase L'Incroyable and apply to my hair before using the hairdryer and GHD. The serum protects my hair and the L'Incroyable keeps my hair smooth and styled until the next time it is washed. I have a full review here but basically it acts like a hairspray without the need for hairspray and doesn't feel like there is any product in the hair, yet it maintains my style, even if I tie it up. L'Incroyable is £15.30 and the serum is £15.25. The combination of all of these products has my hair looking and feeling the best that it has done in quite a while. The only product missing from my regime is an intensive mask so if you have any recommendations, please leave them below! Have you used any of these products? What are your current haircare favourites? All products are bought by me, unless otherwise stated. The Grow Gorgeous and Uniq One products were sent to me. I bought the Kérastase products myself. Opinion is always my own.